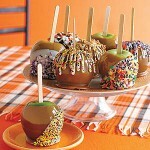 Twitter account FoodPorn_ (which you should follow only if you don’t mind gaining 50 lbs) recently tweeted this photo of embellished caramel apples, and after quite a bit of googling I finally tracked down the original source…which, annoyingly, doesn’t provide details on the actual decoration. (It does, however, have a pretty good recipe for the caramel itself, in case you’d rather use from-scratch instead of store-bought caramels.) My guess is that they’re just dipped in candy melts and then in sprinkles. The initial search did turn up some other interesting ideas, including these aggressively-festive things, and these cute jack-o-lantern and spiderweb designs. There are also some great ideas here (photos are at the bottom of the page–I love the little ghosts). If you’re feeling brave you could also coat them with dried mealworms, and if you’re not-so-brave (or you want your friends to still like you), use the realistic-looking gummy earthworms instead.